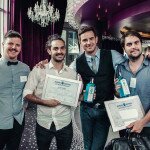 Bombay Sapphire held an exclusive competition for 9 bartenders from across the country to compete to become Bombay Sapphire South Africa’s Most Imaginative Bartender. Our winner was Assaf Yechiel, bartender at one of the coolest cocktail bars in Cape Town – one you know well – The Orphanage. We’re flying Assaf to Tuscany, Italy in May to represent SA and compete with the other international finalists for the title of World’s Most Imaginative Bartender.